iPad Pro vs. Surface Pro 4: What're the Difference? With the iPad Pro, Apple has created a tablet with more power than ever before. The most-repeated is that its A9X chip is a desktop-class processor that fits inside a tablet. When thinking of the tablet that run desktop OS, Microsoft Surface Pro has already entered the market for a long time. The battle between Apple and Microsoft has never stopped, and Apple's iPad Pro is the company's most direct answer to the Microsoft Surface (Surface Pro 4). What are the differences between iPad Pro and Surface Pro 4? Which one do you prefer? This article compares the features and specs of the Apple iPad Pro and Microsoft Surface Pro 4 to give you an overview. Although the two tablets may look a lot alike, the iPad Pro and Surface Pro 4 are not so similar in many parts. When comparing iPad Pro and Surface Pro 4, the first thing you'll notice is that the iPad Pro is slightly larger than the Surface Pro 4. It features a 12.9-inch display to Surface's 12.3-inch screen. And it is slightly thinner than the Surface Pro 4, at 7mm (0.27 inches) to the Surface's 8.4mm (0.33 inches). Both devices feature excellent screens with impressive resolution which is perfect for watching HD videos. The biggest difference between the two is that the Surface Pro 4 comes in many more options than the iPad Pro. The iPad Pro runs Apple's latest A9X chipset that's going to make the tablet fast and powerful. Surface Pro 4 has an Intel Core M chipset and runs Windows 10, a full desktop OS along with desktop-class apps. The iPad Pro comes with hundreds of thousands of excellent mobile apps when it ships which will make it easy to consume media, access social networks, play relatively simple games, and dip a toe into using the tablet as a productivity device. However, although there’s a lot of apps for that, it doesn’t compare to being able to run a full desktop OS like Windows 10 or OS X on the Mac. You can't mirror iPad Pro's display on a bigger screen unless buying a Lightning to HDMI adapter, while the Surface Pro 4 has a Mini DisplayPort for video out. Apple TV owners can also use AirPlay to wirelessly beam their screens to TV sets. Similarly, the Surfaces support Miracast streaming to an Xbox One or any TV with a Miracast receiver plugged into it. Both devices support keyboards and stylii. The iPad's stylus, the Apple Pencil, adapts to how much pressure you put on it, and the Surface Pro 4's stylus, the Surface Pen, has 1,024 touch levels, an eraser on the end, and interchangeable tips. But the Surface Pen is included with the system, while the Apple Pencil is an add-on that will cost $99. The keyboard is not included in the iPad Pro either (cost extra $169). The Surface Pro offers an optional keyboard cover. However, it’s keyboard cover also features a glass trackpad–meaning you can use the Surface as you can a laptop, that is: how you’re used to. Both Apple iPad Pro and Surface Pro 4 are best for playing HD videos. The iPad Pro's 12.9-inch Retina display has an equally impressive 2,732-by-2,048 resolution with 264ppi. The Surface Pro 4's 12.3-inch touch display has a 2,736-by-1,824 resolution with 267 pixels per inch (ppi), and sports Microsoft's new PixelSense technology, which is extremely bright with rich colors. These spec make both iPad Pro and Surface Pro 4 are perfect for presenting things to people, such as playing HD videos. It is a good news for people who have a lot of movie collections in iTunes, as iPad Pro can play them perfectly. If you are using Surface Pro, you will need to convert the iTunes M4V movie to MP4 or other formats for playing and keeping on the tablet. 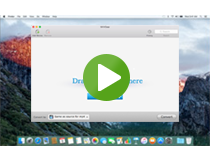 M4VGear DRM Media Converter would be the best tool for removing DRM from iTunes purchased and rental videos and convert to other formats for playing on non-Apple devices, while keeping 100% lossless quality, retaining all subtitles and audio tracks. Try M4VGear DRM Media Converter for Free! The entry-level Surface gives you the same amount of internal storage (plus microSD slot) as the top-level iPad Pro. While the iPad Pro will be the most work-friendly iPad yet, the Surface's (if nothing else) extra storage, trackpad and ports will make it behave much more like a traditional laptop. All in all, the Surface Pro 4 has the guts of a laptop, whereas the iPad Pro is still just a tablet, albeit one with the latest, fastest Apple chip. Have any ideas about iPad Pro or Microsoft Surface Pro 4? Just leave your reply.